American High School has been busy fighting climate change. During a week in December, thirteen Chemistry classes at the Fremont, CA high school participated in EarthTeam's popular Transportation Action Project which get students working collaboratively to reduce their CO2 emissions by choosing transportation options that burn less or no fossil fuels. During the Transportation Action Project students start out by learning about climate change, fossil fuels, energy and transportation issues. Students audit their transportation to and from school for five days to get a baseline, then analyze the data and make an action plan to reduce it. Then for one week students attempt to lower their CO2 by changing the way they get to and from school. Strategies such as adding another passenger to their carpool, biking for a day or two, walking one way instead of driving, and taking the bus are popular. 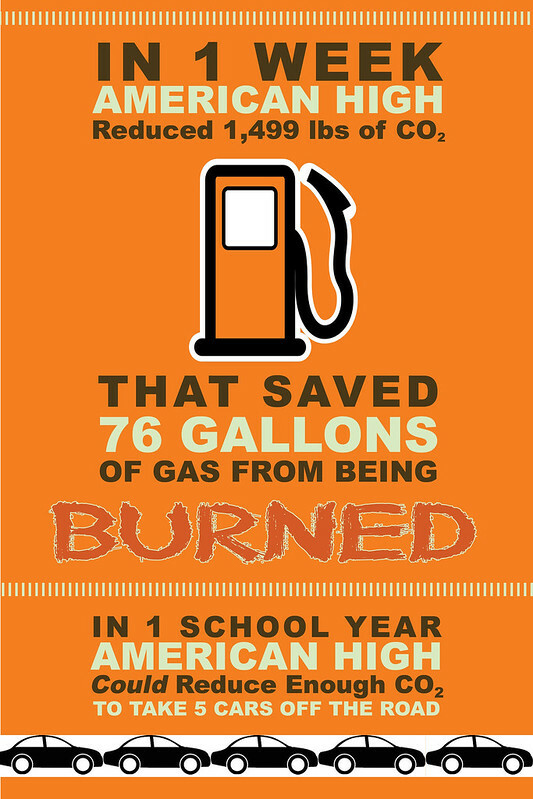 In one week 320 students at American High reduced their CO2 emissions by 677 lbs. They didn’t stop there however. American students reached out to friends, neighbors and family members to join in the effort which resulted in an additional 822 lbs of CO2 reduction. Combined student efforts during the Transportation Action Project at American High resulted in a total of 1,499 lbs of CO2 reduction. According to the EPA, this many pounds of CO2 is the equivalent to 76.6 gallons of gas being burned. Those are impressive results for one week’s effort and those types of numbers add up over time. If students maintained those reduced emission levels throughout the school year, they would be saving the equivalent of over 2,740 gallons of gasoline per year. EarthTeam applauds the efforts of the students and faculty at American High School for their exemplary work helping reduce CO2 and spreading awareness transportation issues on their campus and greater Fremont community.